Everyone should aspire to be be listed on the First page of Bing, Yahoo, and Google search results for their keywords. It takes research, SEO research of your competition, of their sites and their marketing. We look at what search keywords your competitors are targeting and what consumers are actually searching for. Then we can draft a strategy plan of SEO or AdWords campaigns or Display Pay Per Click banner ads. For categories that are uncluttered like “aircraft machinists” it is easy to move your company to the 1st Page of organic searches. 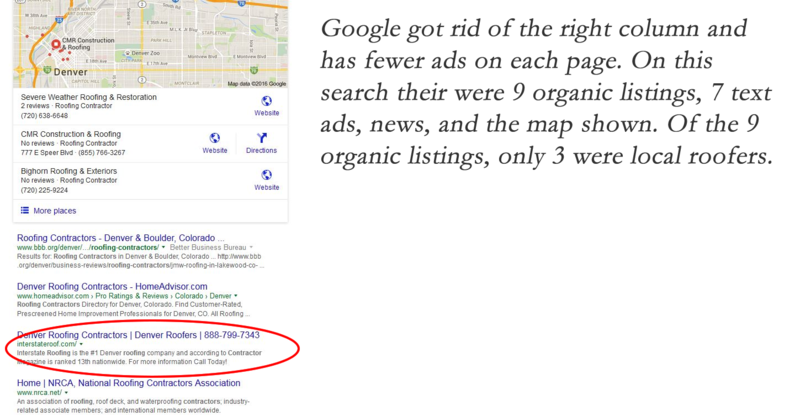 (Organic searches display free listings) If you are a plumber, then it will take months of work to get you to the 1st Page. Some keywords are easier than others to rank high for. Agencies that promise you Page 1 in one month are simply optimizing your “Google My Business” listing (the old Google Maps), which is a good thing, but only takes them one hour of work.